I took a close look at the ice along the lakeshore this weekend. There are not large or dramatic formations to look at at this point, true. But there are intricate and elegant forms, if you look closely! Take a close look at an edge of ice. Edges are jagged. The patterns are erratic; broken at spots with clean edges, but others have extravagant latticework. Peninsulas, isthmuses in ice. Ice broken up by holes, interior and exteriors both with rolling, rounded borders. Here, long sections of snow and ice, 2-4 feet wide, with lots of ‘edge snow habitat’ for viewing. Lots of thin slices of ice to look at. Easier to see the patterns in these thin slices than in the snow piles. Plateau-like. Appears that melting occurred underneath surface of ice, leaving thin slices overhanging the sand. Delicate slices. I picked a piece up, of what appeared to be ice borders coming off of snow piles, but I don’t know which category to stick it under for sure. There was surprisingly varied depth underneath. The surface seemed pretty flat, but it wasn’t flat at all underneath. As I walk on the ice, I enjoy the simple pleasure of sliding on it. We forget that this is a distinctive experience – where else does one normally slide, other than on ice? It is an experience available locally, cheaply; it can be a little risky, a little bit of an edge activity, for the young and fit (and well-balanced). Next to the ice, I saw a strange mushy sand left behind by melting. Looks like bubbling, pebbly shapes in it. 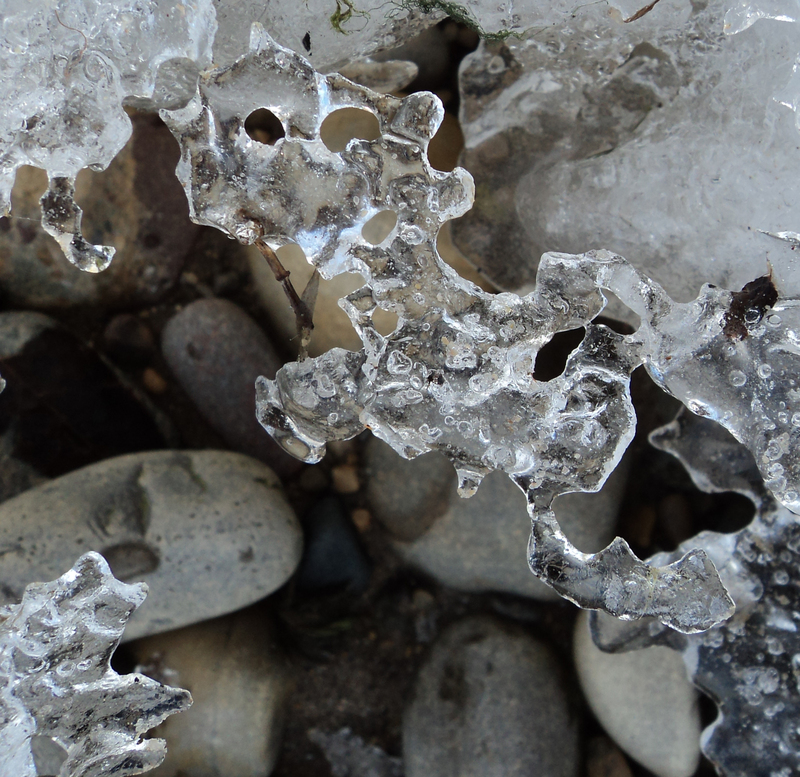 But its more typical to see sand on the beach which is shaped by ice and freezing into speckled patterns. Hard ledges, in areas. Weird to be walking on sand, and have it stick, rather than be a powder you can kick up (or slip into) as you stride. I liked a spot where it *appeared* that the ice was moving onto the sand, slowly extending its reach – while next to it, sand was visible through holes in ice, as if sand was melting its way through over there. Sand sprinkled the surface of the ice throughout the few feet of this area, for an intriguing mix. Off the ice, the sand was frozen too, hard, as sand and ice interpenetrated, overlapped. Frozen sand, in areas that had recently lost their ice and snow covering, tended to have miniature peaks and depressions, with a darker tone and clearer set of fleckings than sand elsewhere on the beach. Fun to see visible ice patterns, frozen… within / beneath surface of ice. Nearby, rocks each have clean borders around them, with a miniature melt zone around each. Lots of small icicles hang down from ledges over water. Look like a series of creatures mouths, half-risen above shore, about to bite down over it. I checked all this out, and took notes – and since it was warm enough, only my hands (without gloves as I took notes – I forgot my liner gloves for writing with) really got warm. That’s mild winter for ya! The cool air on my face was a kind of ‘its nice to feel a little something different on my face’ kind of cool, especially since I was bundled and warm throughout the rest of my body. This entry was posted in Highlighted posts, Observations and tagged ice and sand, ice observation, ice photos, nature writing, winter beach. Bookmark the permalink.